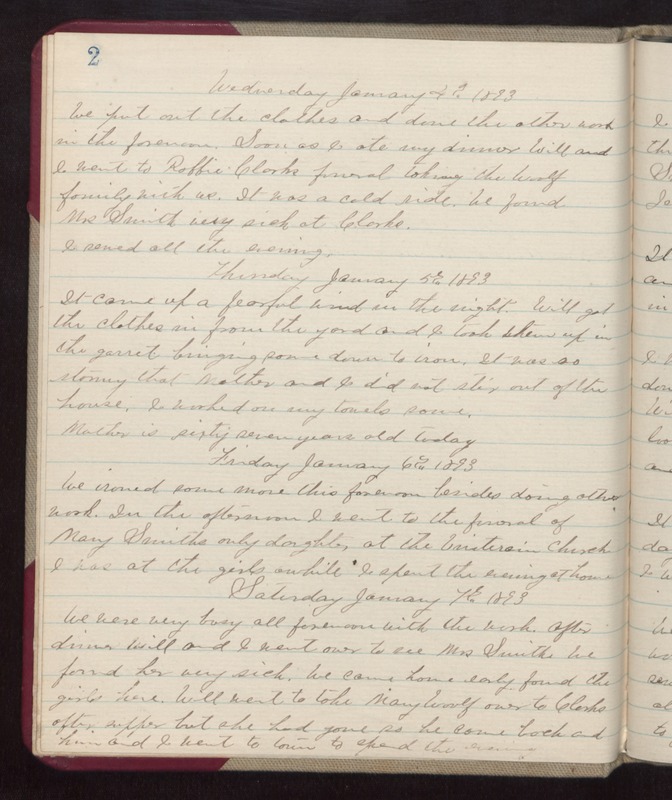 Wednesday January 4th 1893 We put out the clothes and done the other work in the forenoon. Soon as I ate my dinner Will and I went to Robbie Clarks funeral taking the Woolf family with us. It was a cold ride. We found Mrs Smith very sick at Clarks. Thursday January 5th 1893 It came up a fearful wind in the night. Will got the clothes in from the yard and I took them up in the garret bringing some down to iron. It was so strong that Mother and I did not stir out of the house. I worked on my towels some. Mother is sixty seven years old today. Friday January 6th 1893 We ironed some more this forenoon besides doing other work. In the afternoon I went to the funeral of Mary Smiths only daughter, at the Unitarian Church. I was at the girls awhile I spent the evening at home. Saturday January 7th 1893 We were very busy all forenoon with the work. After dinner Will and I went over to see Mrs Smith. We found her very sick. We came home early found the girls here. Will went to take Mary Woolf over to Clarks after supper but she had gone so he came back and him and I went to town to spend the evening.